***You can purchase an INEXPENSIVE AD-FREE PDF of this pattern on Etsy HERE and on LoveKnitting HERE! This beautifully formatted PDF includes the step-by-step pictures, double brim tutorial, and pattern and is a total of 7 pages including the cover page! You can also find this pattern in my Easy & Modern Knits Pattern Bundle found HERE (includes over 20 of my knit patterns at a discounted price)! Lion Brand Yarn has made a convenient kit HERE that includes ALL the Chainette Yarn needed to make BOTH the adult and child size beanies along with the patterns! Chainette Yarn from the LB Collection is one of my absolute favourite new yarns. It is an incredibly soft, worsted weight (level 4) yarn that is 70% Baby Alpaca, 18% Virgin Wool, and 12% Polyamide. It has a modern “chainette” construction which allows air to pass through, making it very lightweight with a slight halo. I absolutely love the colours available, and they were begging to be combined together. I had an idea for a beanie with a double brim and delicate striping, so I decided to combine Pink and Cream together using my 5 mm 16″ circular needles! This hat is very fun to knit up because it is comprised solely of knit stitches worked in the round (stockinette) with no ribbing or purling at all! 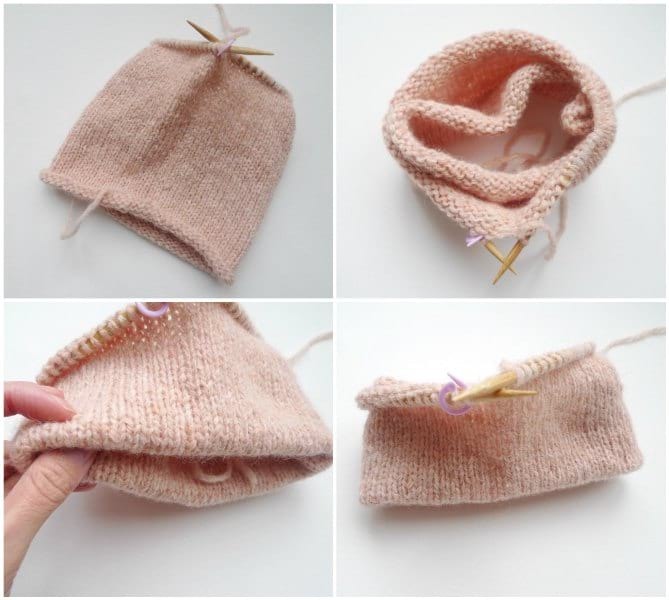 To make the double brim, knit an extra long tube (double the height wanted for the brim). Then, fold the tube in on itself so that the stockinette stitches are on either side and the wrong sides are facing each other. Next, locate the cast on stitches or horizontal bars from the first round. The initial tail shows me where to begin as this indicates that this was the first stitch of the round, so I want to pick up that cast on stitch first. 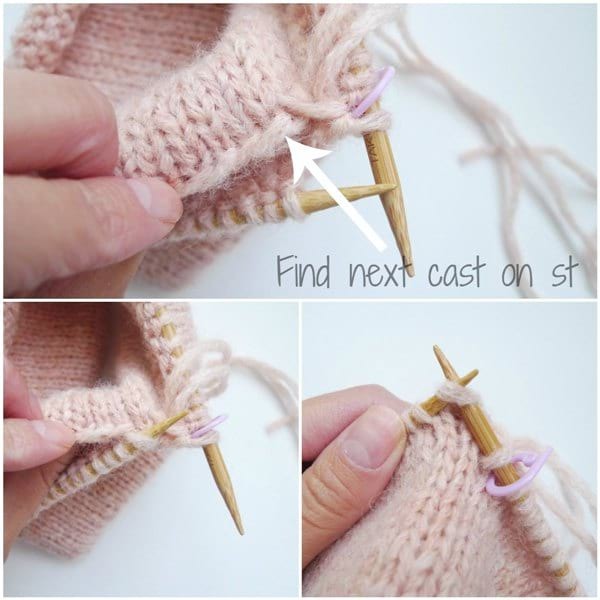 Use the left needle and pick up the first cast on stitch. Insert the right needle into both stitches, i.e. the first stitch of the round and the cast on stitch you just picked up. Yarn over and work a knit stitch (treat both stitches as one). The knit stitch is complete! It is now time to find the next cast on stitch as indicated by the arrow. Once again, you place it on the left needle and knit the two stitches together. 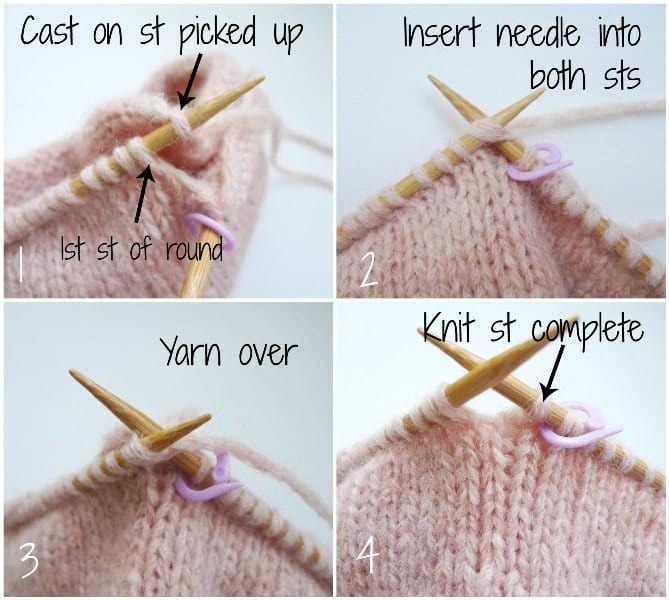 You very methodically and slowly pick up the cast on stitches and knit them together with the stitches on the needle. Be sure to take your time as I made a mistake several times and had to undo my work when the number of stitches did not match up. It is so satisfying when you have completed the secure and sturdy double brim! Please watch the video below as I demonstrate how to knit the double brim for this beanie! After the double brim has been worked, it is time to add the contrast color. You work two rounds of each color before switching. You do not need to cut the yarn every time as you can simply drop the color not in use and pick it back up when needed. Knit this cozy and warm beanie featuring a sturdy double brim and modern striping! This unisex hat can be worn by all members of the family, and is a great way for moms and dads to twin with their little ones as adult and child sizes are provided! Chainette Yarn from the LB Collection – worsted weight level 4 yarn (70% Baby Alpaca, 18% Virgin Wool, 12% Polyamide); I used the colors Pink & Cream, Mustard & Beige, and Silver & Cream together. The entire hat is worked in continuous stockinette in the round. 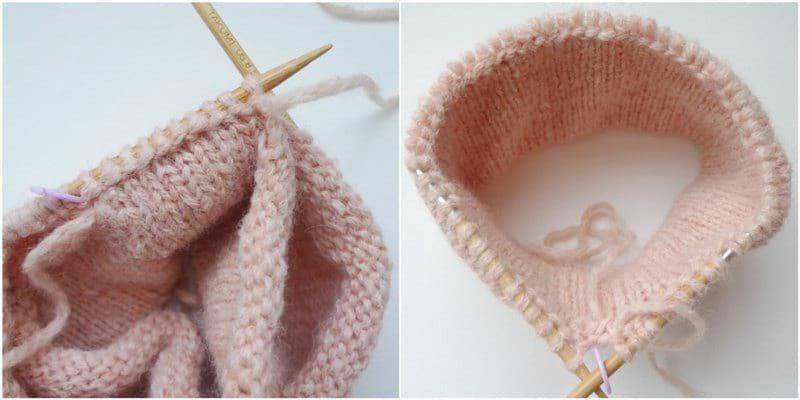 The double brim is formed by folding up the tube, picking up the cast on stitches, and knitting them together with the working stitches. This forms a very secure and warm brim made of two layers. After the double brim is worked, alternate the contrast color with the main color every two rounds. 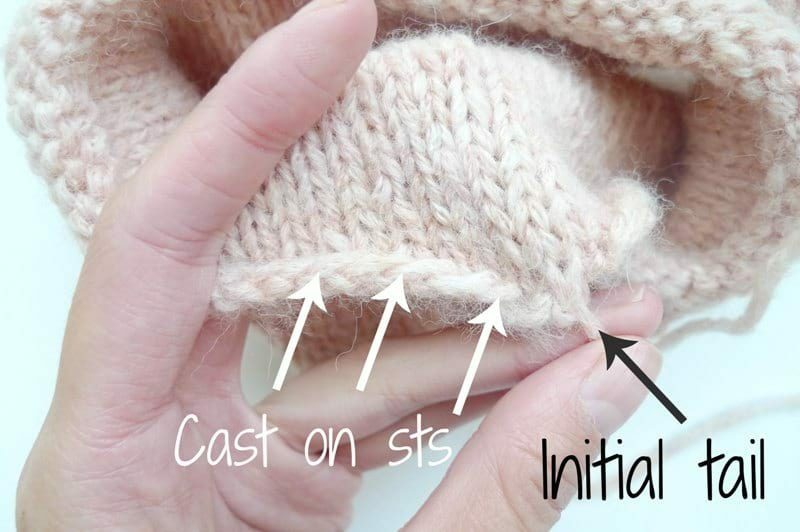 Once the final height has been reached, we will close up the beanie by threading the tail through the last stitches with a yarn needle, pulling tight, and tying knots to close up the hole. Add more rounds to the body of the beanie if more slouch is desired. The child size fits 3-7 year olds as it is capable of stretching (my daughters pictured are 4 and 6 years old). If you would like to figure out more sizing, cast on multiples of 6 (e.g 72 or 78). Alternate decrease rounds with rounds maintaining the same number of stitches. For both the adult and child sizes, 7 Contrast Color Stripes are worked before the decreases begin. Using 5 mm needles and long tail cast on (leave 56″ long tail), cast on 66 stitches. We will now work the double brim. Fold tube inside itself so that stockinette is on either side and wrong sides are touching each other. Look for the initial yarn tail as this indicates where the first cast on stitch is. Cut yarn and leave long tail. Thread tail through last remaining loops and pull tight. Fasten off and weave in end. Using 5 mm needles and long tail cast on (leave 72″ long tail), cast on 84 stitches. The Horizons Beanie knits up quickly and is a fun project since it is segmented into different sections: the double brim and delicate stripes. I finished the Mustard/Beige beanie on the airplane ride to New York, and I was so happy we could take some final pictures in the stunning Oculus! The cozy double brim feels so secure and really hugs your head- that second layer really makes a difference and provides extra warmth! The stripes are a neat way to add some colour variation while still providing a classy and sophisticated feel. 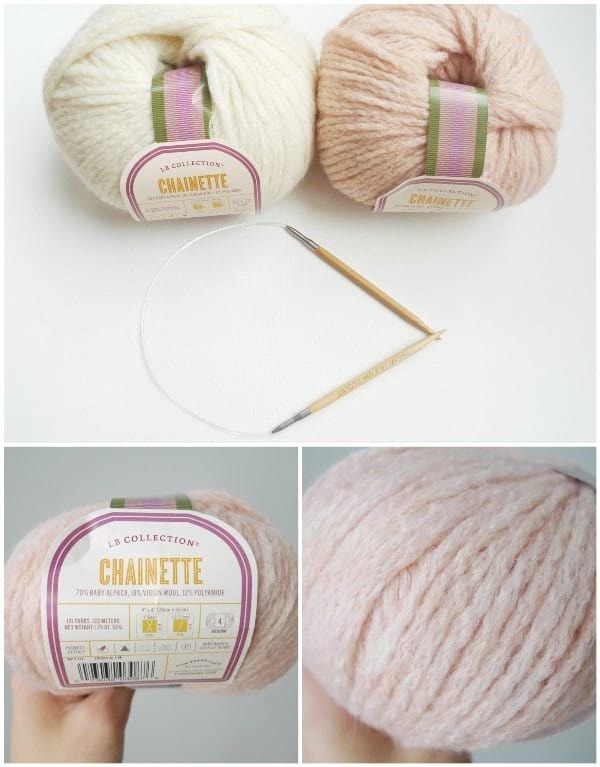 Since Chainette Yarn is a baby alpaca wool blend, it is VERY warm and soft! I loved wearing my Horizons Beanie around New York City as it protected my head from the strong winds. I think it pairs well with my statement Longbourn Scarf, don’t you? Handmade knits add such a cozy and elegant feel to any outfit! I snapped this picture of my cute outfit while we were shopping in Century 21! I am wearing my Horizons Beanie, Longbourn Scarf, camel coat from Ingni (which I got from Tokyo), Foldover Bag by Jimmy Beans Wool, and Sporto Duck Boots. When we returned home, we took some mommy-daughter photos to show off our matching pink hats! The girls were elated to be able to match with me, and they commented about how soft the hat was. Look at those big smiles! The Horizons Beanie looks so adorable on children with the fun stripes! We even have matching Uniqlo teddy fleece jackets too which are incredibly soft and cozy as well- we are all about maximum coziness! Lion Brand Yarn has put together a convenient kit containing all the luxurious Chainette yarn you need to make 1 adult size Horizons Beanie and 1 child size Horizons Beanie along with the patterns! This yarn is from the LB Collection and only available online or in the Lion Brand Yarn Studio in New York City. It is currently 20% off and you can snag your own kit HERE! 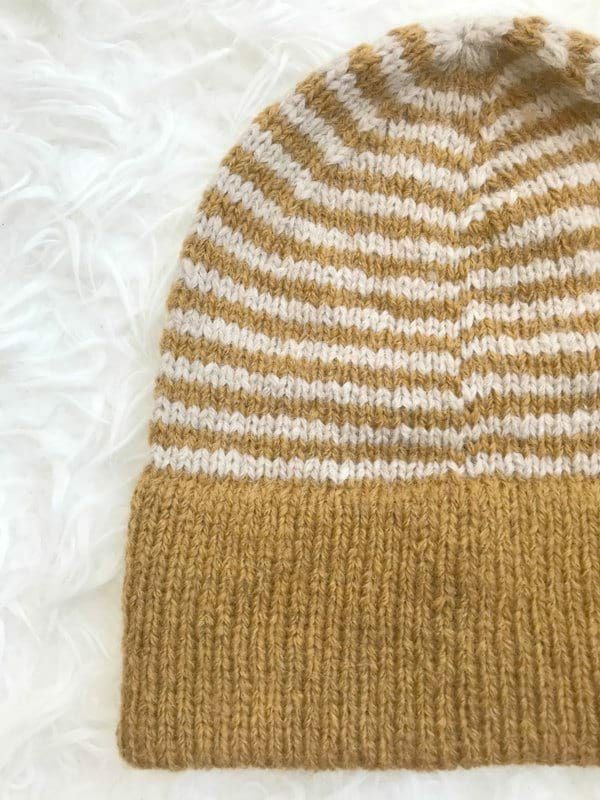 If you have never tried knitting a double brim, I hope that this design and tutorial has helped inspire you to give it a try! It really is not too difficult once you know how to do it, and the end result is gorgeous. The design keeps it interesting with the double brim and switching up colours, and I hope you enjoy knitting it as much as I did! Subscribe to my e-mail newsletter HERE to get all my updates and designs straight to your inbox! Happy knitting, everyone!